Lavender plants derive aroma from essential oil. Essential oil was an integral component of most ancient forms of medicine dating back to early Chinese and Egyptian civilizations. The Greeks understood the beneficial properties of aromatic plants. The Romans and later the Arabs, perfected the knowledge acquired from previous civilizations. Scientists continue to unravel the secrets contained in plant cells, confirming many of the therapeutic practices of antiquity. One mythical interpretation of essential oils describes them as the vital life force of plants, equivalent to the human spirit. 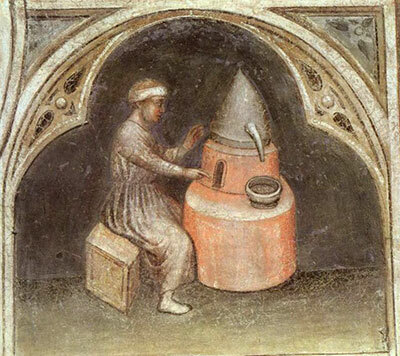 Methods of extracting essential oil from plants date back over 2000 years. Egyptian alchemists are credited with the modern copper “alembic” designs that are used for extracting oil from plant material. During our first essential oil distillation experimentation we used a small glass science lab set up that was left to us from the previous owners of our farm. He told us he stopped using it because it did not yield much oil and was difficult to clean. We have since found, with the addition of some larger glass components, that this distillation apparatus is quite effective. By maintaining proper plant handling methods and carefully timed use of applied steam, we have been able to produce high quality essential oil. As our interest in distillation grew, so did our research in developing methods that would allow us to improve the process and produce an essential oil product that we could offer as locally sourced, naturally grown and processed at our farm. 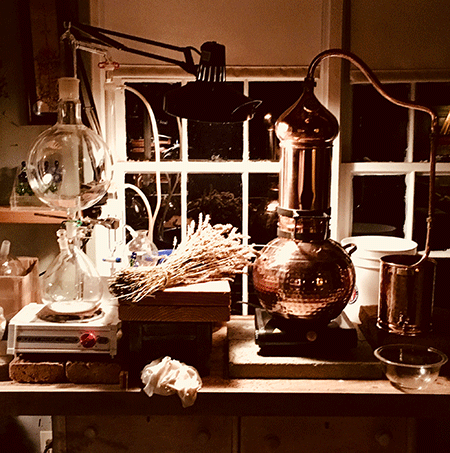 Experimenting successfully with glass equipment gave us confidence to begin exploring more traditional methods of distilling essential oils, which led us to discover the world of copper “alembic” distillers; an ancient design with a storied history in the legends of alchemists. To be able to distill oil from plants grown on our farm has been a profound experience. Even though the distilling equipment is quite simple, becoming part of a historically revered alchemy process is remarkable and gratifying. Our pure, farm distilled essential oils are available at our farmers market stand in charming 10ml colored, tear drop shaped glass bottles. We are pleased to offer Lavender (Lavandin), Eucalyptus and Rosemary oil for our market customer’s aromatic pleasure.